Vcolor 368 M L controllers manage all the most up-to-date functions of electric combination ovens for gastronomy and pastry-making. Additional optional modules also make it possible to control ovens with an external boiler and gas burners. Their innovative programmable platform enables the OEM, completely independently and without the use of additional software or hardware, to personalise the user interface graphics to an advanced degree, to set up the recipe book with high quality photographs and to add new machine interface languages. 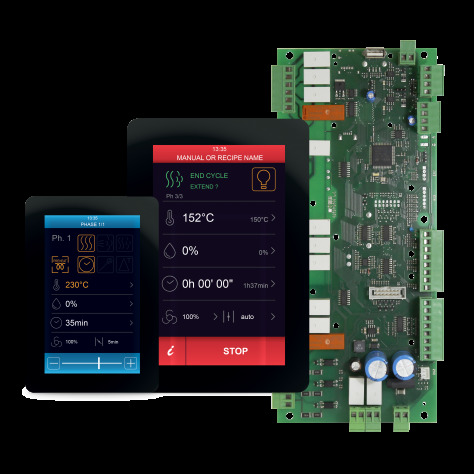 Available in a 5 or 7-inch version with a capacitive colour TFT touch-screen graphic display, they can be installed flush with the panel thus making them fit perfectly with the design of the unit. Watch the tutorial video to personalise recipes, graphics and languages: https://www.youtube.com/watch?v=_CH0xvtvy0M.